Every now and then we get asked about how SeniorsAloud came about. How did a humble little blog that started in May 2008 grow to be the country's best-known go-to source for news and issues concerning older adults? Since 2010, US-based Seniors Homes has nominated SeniorsAloud for the annual Best Senior Living Awards in the category of Best Blogs by Organizations. It is an honor that we have kept silent about... till now. SeniorsAloud has come a long way since its first media coverage in The Malay Mail in 2008 (see below). Much of what was written in the full-page article still holds true today. However, SeniorsAloud has expanded so much in the intervening years that an update is necessary at this point. SeniorsAloud's first media interview in The Malay Mail published in Aug 2008. Click here to read the full article. With countries worldwide expressing concern over the rise in their ageing population and the problems associated with it, SeniorsAloud saw a need to raise public awareness of the challenges faced by the older generation in the hope that the government would step in and help this often-neglected segment of the population. (Left) This blog post written in 2008 was later published in the Asian Beacon. Click here to read. 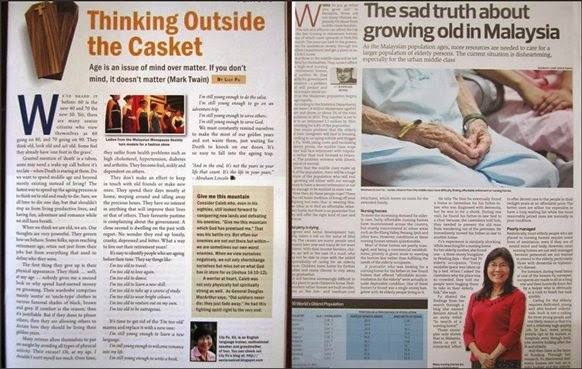 (Right) The Heat newsweekly carried the above interview with SeniorsAloud in 2013. You can read more here. SeniorsAloud's raison de'etre is to help senior citizens be better prepared for their retirement years so that they can enjoy quality of life in their old age. We have to take charge of our own future, and not rely solely on the government or our adult children to provide for us in our old age. We see lifelong learning and social networking as two of the best ways to achieve this objective. To this end, we regularly organize talks and workshops and invite well-known professionals and specialists to share their expertise on how to plan effectively for a happy retirement. Click here for a list of some past events we have organized. We place special focus on information technology for seniors so that they will not be left behind as the rest of the world advances. Indeed, the ability to use online resources is vital to keeping seniors mentally engaged and socially connected. 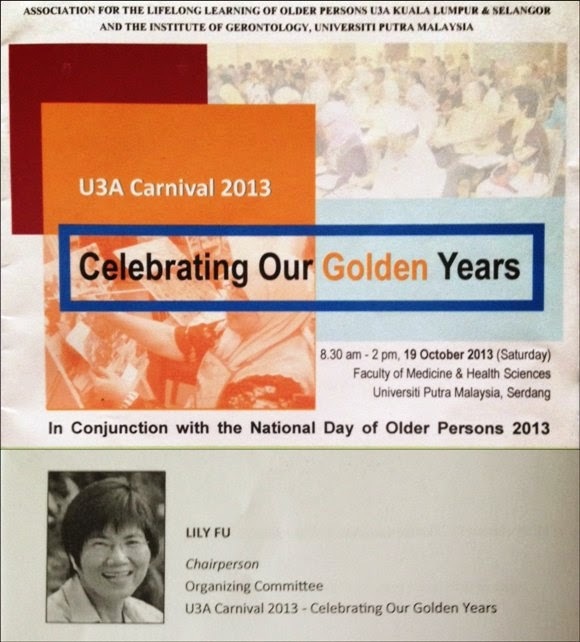 We work closely with U3A (KL & Selangor) to help promote livelong learning to older adults. To date we have worked with academic institutions such as the Institute of Gerontology, UPM Serdang and with Universiti Malaya in their MElor Project. We have also been invited to participate in PEMANDU's Seniors Living / Aged Care Lab, and to conduct a session at the Nursing Workshop on Geriatric Care organized by KPJ. As staunch supporters of volunteerism, we believe firmly that as seniors, we have a duty to help other seniors in whatever way we can. If we can't donate money, we can contribute our time and energy to help raise funds for them. Within our SeniorsAloud community, we have members with vast working experience and skills that we can draw upon to train other seniors looking to set up a home-based business or learn about social media. We also have a wealth of life experiences that we can share with others going through similar experiences. Our credo is 'Seniors helping seniors to succeed'. 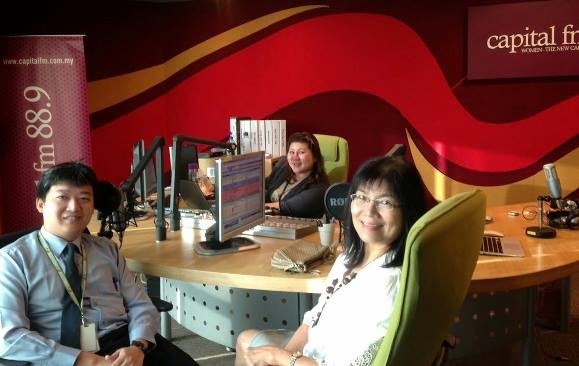 We have often spoken out on issues that affect older adults here in Malaysia, for example, the lack of well-run nursing homes and retirement homes for the elderly, the escalating cost of healthcare and medical treatment, and the need for better public transport facilities for senior citizens. SeniorsAloud was invited to participate in the National Forum on Public Transportation, and met with SPAD officers to present our views on behalf of the seniors community. SeniorsAloud team - photo taken at the recent "Celebrating the 60s" dinner and dance on 31 May, 2014, to raise funds for the homeless elderly. SeniorsAloud owes its rapid growth to strong support from the seniors community, and also to a small team of dedicated volunteers without whom none of our events would have seen the light of day. We are grateful too to the many kind seniors out there who have taken the trouble to send us articles, jokes, and videos to share on our blog. We have started a monthly newsletter for members only, to keep them informed about upcoming activities. Membership remains free and is open to anyone aged 50 and above. To register, go to our members registration page. For daily updates, visit our SeniorsAloud Facebook page. 'LIKE' the page to receive the latest news and announcements directly. SeniorsAloud will continue to speak out aloud on issues that affect older adults. The louder our voice, the better our chances of being heard by the relevant authorities, and for them to implement measures to improve the quality of life for all senior citizens in the country. 'LIKE' us on Facebook to receive our daily postings. To view our FB page, click here.